Green Concrete is an inert building material that passive to the targeted environment by KALMATRON® admixtures. Economical by wide range of recycled and alternative materials including aggregates, water, cementitious materials, and fuels. 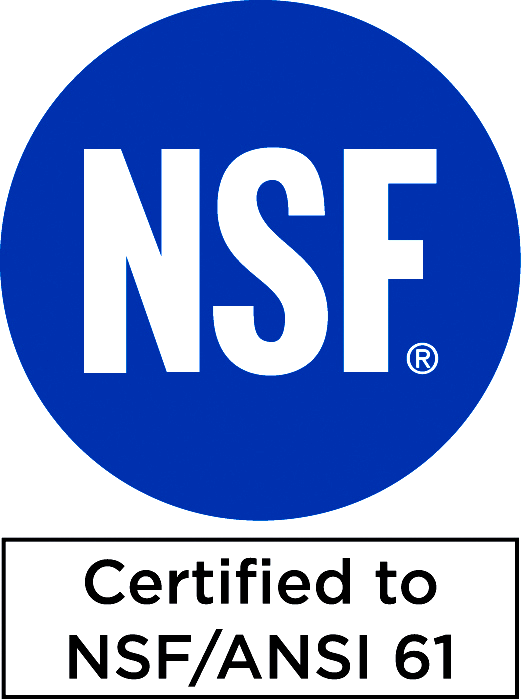 Beneficial use of byproducts for cement and concrete production. 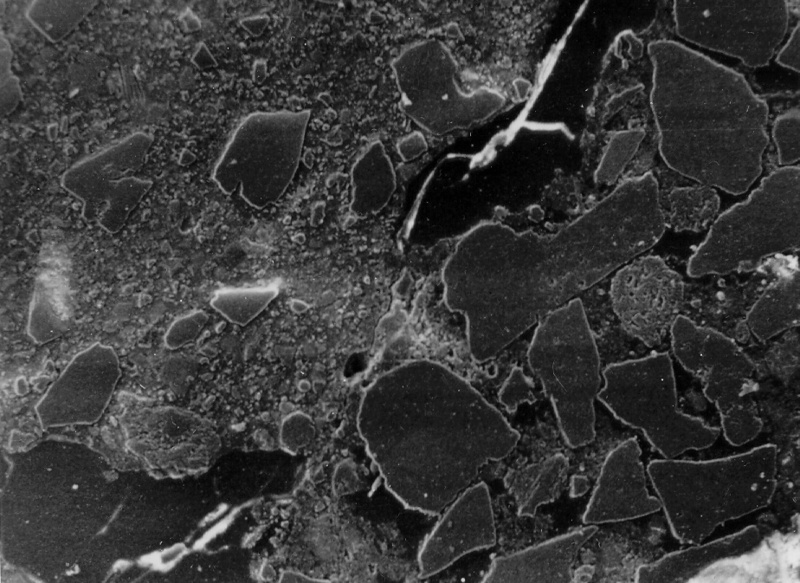 At the same time Green Concrete has a resemblance of natural rock created by volcano heat and tectonic pressure to form an approximated isotropic structure performing its strength, impermeability, and resistance to corrosion for hundreds of years. 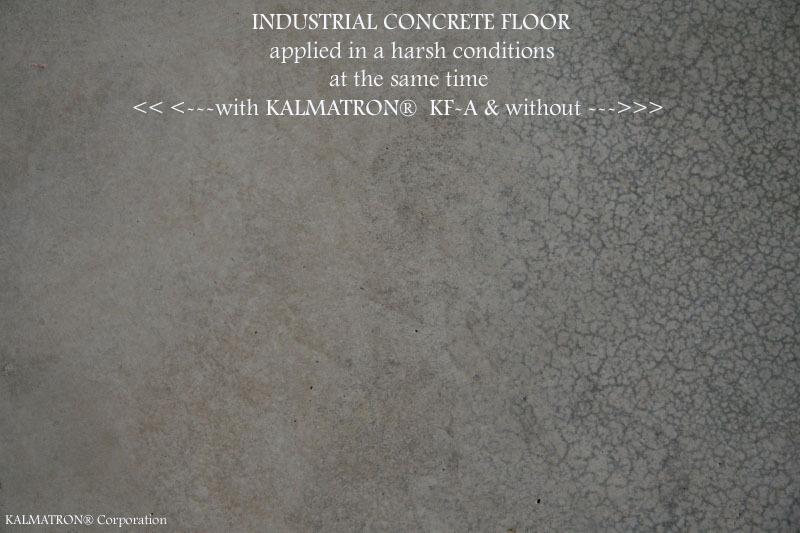 Trace of forklift wheels is vanished onto the surface of concrete with KALMATRON® KF-A. Applied at the same time, that concrete has no byproducts of CO2 emission like cement and free lime dusts. 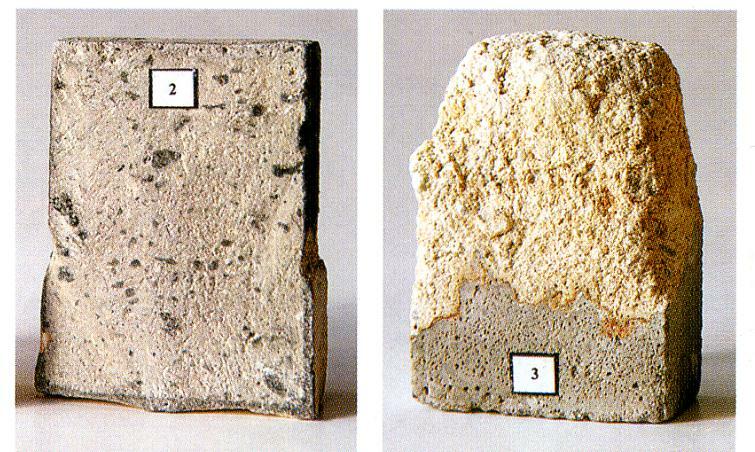 Left concrete sample coated by KALMATRON® KF-B and unprotected concrete sample at right were submerged into 25% solution of H2SO4 for a week to be compared by material loss. Left one is almost intact. It is a half of concrete cube with KALMATRON® KF-A being sawed after submerging into the water for 17 days. Seen superficial penetration on a depth on initial capillary sorption. 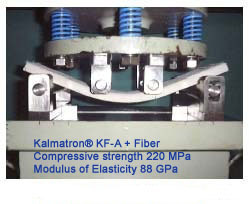 Concrete with KALMATRON® KF-A and added vinyl fiber.performed Compressive Strength by 220 MPa and modulus of elasticity by 88 GPa. 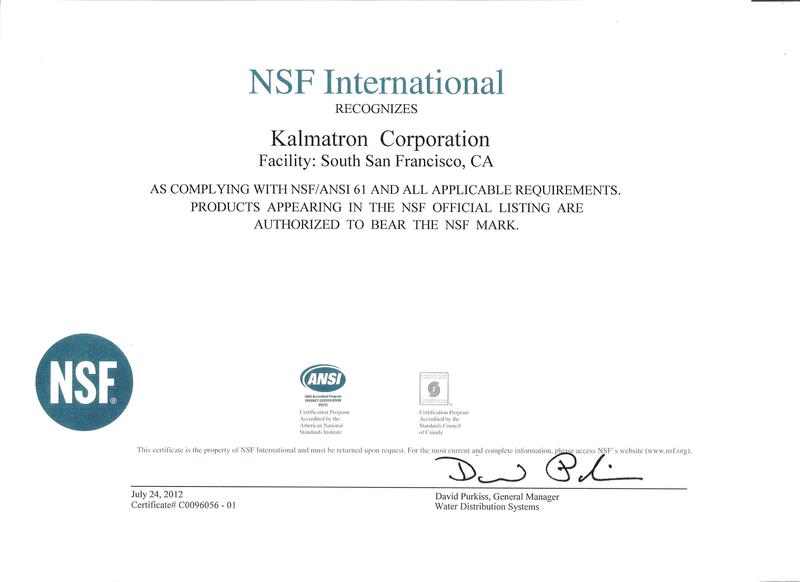 This property propagated KALMATRON® admixtures for advanced replacements of HYDRO ISOLATIONS, FIBERS, SILICA FUME, MICROCEMENTS, etc. It is a cost‐effective solution that transforms conventional concrete mixes into High Performance Concrete. For instance, concrete or mortar made with KALMATRON® has no shrinkage cracks, is impermeable to liquids and is resistant to any type of corrosion. 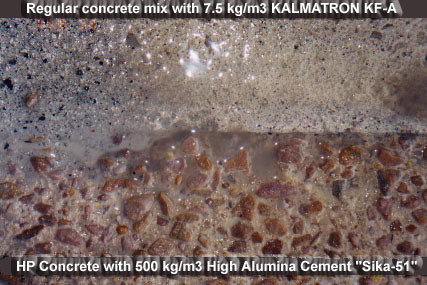 Concrete specimen made with KALMATRON® KF-A was cracked after temperature shock. After that specimen was submerged into the water for 4 hours to restore gel-crystalline balance of concrete structure. Sequence of microcrack re-crystallization by KALMATRON® KF-A.osmotic diffusion. This is actual demonstration of importance of gel-crystalline balance in the concrete structure. 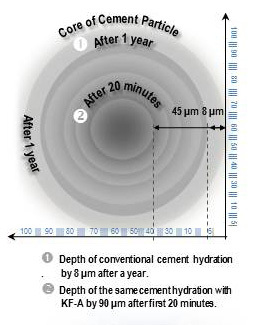 It is an erroneous belief that compressive strength is gained by crystal-developing admixtures, which is effective up to 90 days and after causing concrete fragility, dilatation and cracking. The more massive the structure the faster damages appear. It explains the most of structural failures of dams, bridges decks, suspended slabs, etc. 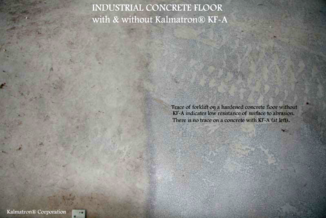 On the top half of the picture is Regular Concrete with 7.5 Kg/m3 or 13 LB/CY of KALMATRON® KF-A. below is a Lafarge High Aluminum Sika-51 cement dosed by 500 Kg/m3 of 843 LB/CY. Products were applied at the same time on the floor of acid room in a smalt production mine (Australia). 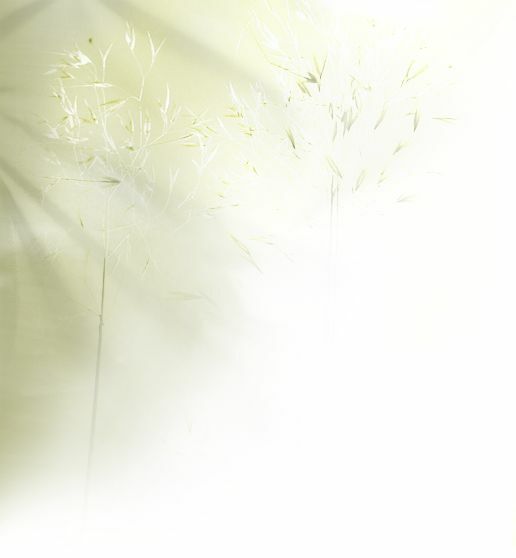 They use electrolysis process with solutions of 30% sulfuric acid and cooper sulfate. This photo was taken after 9 months. 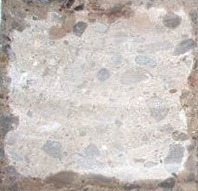 Shown is the intact surface with KF-A (above) and deteriorated surface of concrete with Sika-51 with appearance of aggregates. After 18 months that concrete was totally destroyed.